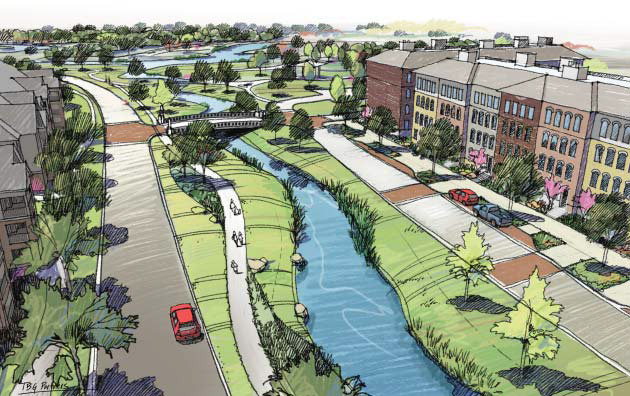 Enhance the Five Bridges at Antoine, West Little York and Victory crossing White Oak Bayou and Vogel Creek to celebrate the waterways with a signature look, new trails at water's edge. Create White Oak Gardens, a regional destination park, with a location backing up to the White Oak Bayou. This project has the ability to leverage the trail and greenway system while establishing a regional landmark on Antoine that draws visitors from near and far. Coordinate redevelopment of Bayou Boulevard at White Oak, on property formerly occupied by deteriorated and abandoned multi-family projects and transform De Soto Street into a linear water channel that connects a proposed park at the White Oak Bayou at the east end with a proposed plaza and water feature visible from Antoine at the west end. 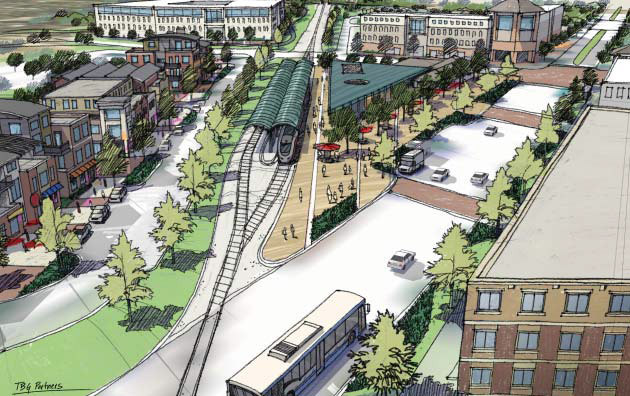 Develop White Oak Station, a multi-modal transit hub with a signature express bus service that will also accommodate light rail transit on the Burlington Northern line in the future. The Near Northwest Livable Centers Study Area presents both a prime opportunity and a tremendous challenge for the surrounding community, the City of Houston, and other various public agencies and not-for-profit organizations. Its single family neighborhoods could re-emerge as a residential location of choice for middle class homeowners through a multi-faceted transformation – of mobility, of environment, and ultimately of the local market economy – centered on the improvements identified in this study. The City of Houston has already taken unprecedented measures to stem decay and begin moving the area in a more positive direction. While this has been an excellent and necessary start, the market forces, legal realities and physical conditions that brought the Study Area to its position today are not easy to redirect. The Near Northwest community and the City of Houston will have to recognize that accomplishing the transformation in a reasonable time frame will require a substantial additional financial, organizational, political, and human capital commitment over a sustained period of time. Create an urban environment that is distinctive and memorable to those within or through the Study Area while enhancing street connectivity as the area redevelops. Stabilize and fortify the commercial, single-family and multi-family residential markets by reducing the supply of nearby deteriorated, blighted, and nuisance properties and replacing them with uses that have more positive effects on value. Elevate the Study Area’s regional market awareness through unique and functional open space investments that simultaneously build community. Capitalize economically on existing and potential transit services. Strategic Objective 1: Create an urban environment that is distinctive and memorable to those within or through the Study Area while enhancing street connectivity as the area redevelops. Action: Turn Antoine from the BNSF tracks to Victory into an attractive boulevard with residential and urban design segments. Currently the primary method of exposure for the Study Area is the experience travelers have who pass through on the major thoroughfares, most notably Antoine Drive. Antoine is the primary north-south transportation link through the area and the location of most of the Study Area’s retail activity. Its functionality and presentation has an outsize role in the quality and appeal of the area to potential residents, investors, and shoppers. Thus the changes in Antoine’s streetscape and cross section, as proposed by this plan, represent a strong opportunity to change market perceptions of the Study Area. Fortunately, for the most part, right of way acquisition should not be necessary. The tasks involved in this transformation will be (1) design and engineering and (2) construction. The design and engineering tasks would be an appropriate responsibility for the Near Northwest Management District to take on, in order to ready the project for action by the City of Houston. Whether done in segments or as a single effort, the construction portion of the Antoine project presents an opportunity for the City of Houston to seek federal transportation funding. Such programs have typically required a minimum 20% local match, which the City could fund either from the General Fund or through Housing and Community Development funds such as CDBG. Given that the low income population in the Study Area will remain high, even as the multi-family housing stock is rehabilitated or reduced, the Antoine transformation should fulfill requirements to serve this demographic. This is especially true because making the corridor more walkable, through improved sidewalks, safer crossings, trees and landscaping, and slower traffic, will directly help the population dependent on transit, walking, and biking. Project readiness is an important consideration for inclusion in the TIP, so advance completion of the aforementioned design and engineering, along with the City’s funding commitment, will be very important. In addition, based on the conceptual design of certain roadway segments being recommended, it is likely that the equivalent of a variance will be required from the City’s Public Works and Engineering Department because these designs may not fit existing approved street section standards. This approval process will also need to occur in advance of funding commitments. It should be noted that various funding programs associated with “stimulus” funding during the current recession (TIGER grants and Ike recovery funds for example) have had different specifications, including some that did not require a local match. Recently this funding has been coordinated with the federal government’s Partnership for Sustainable Communities program between HUD, the Department of Transportation, and the Environmental Protection Agency. The availability of these programs is speculative and partly dependent on national political developments; therefore they would not make sense as the basis for a funding plan in this study. However, the City and the Near Northwest Management District should remain vigilant in case such funding becomes available again; the projects recommended by this study would match well with the Sustainable Communities objectives. In addition, if it is determined that drainage improvements are needed on Antoine that necessitate the reconstruction of the street, Renew Houston funds could be applied as well. The decorative and placemaking enhancements to the waterway bridges in the Antoine / Victory / West Little York area are typical improvements spearheaded by management districts and property owner or business associations. The Near Northwest Management District should be the lead agency in designing and procuring the decorative enhancements as well as maintaining them (including electrical usage). However, as the District’s budget totals only about $1.1 million and has an emphasis on security and public safety programs, its own financial resources to accomplish this are limited. The District could consider shifting some emphasis within the planning and urban design component of its service plan to include the Five Bridges project. The responsibility for detailed design and production of specifications will almost certainly fall on the District. Partnerships with local neighborhood associations and perhaps the creation of a 501(c)(3) (see more detailed discussion under Strategic Objective 3) will be needed to fund the procurement and installation of the enhancements. While Strategic Objective 4 below anticipates a major transit capital investment by METRO, an interim short-term measure with potential benefits from a mobility, marketing and residential location standpoint would be to enhance bus service throughout the area and create a transfer center at the intersection of Antoine and Tidwell. This enhancement would target a service level similar to or exceeding that of Bellaire Boulevard “Quickline” branded service. The H-GAC Regional Transit Framework Study (2010) indicates the Antoine Corridor as a segment of larger recommended express bus or bus rapid transit service corridors under several of its potential scenarios. The study also provides an overview of potential funding strategies and mechanisms, not restated in this report. It should be noted that elements of enhanced service could be eligible for typical TIP-programmed funding such as CMAQ. Strategic Objective 2: Stabilize and fortify the commercial, single-family and multi-family residential markets by reducing the supply of nearby deteriorated, blighted, and nuisance properties and replacing them with uses that have more positive effects on value. Fast track actions: (1) Select suitable properties for rehabilitation assistance between Cole Creek and the former Inwood Forest Country Club. (2) Reduce supply of other lowend multi-family rental / condo and retail properties in the same area. Redevelop into productive private uses and/or public facilities and infrastructure. To date, the single family neighborhoods in the Study Area, while low priced compared to suburban homes of equivalent age and builder quality in Houston, have nevertheless managed to remain viable with houses generally in reasonable condition. However, as these homes reach 40 years in age, they will require more investment and upkeep to retain value. The Study Area’s economic health depends on these homes being purchased by buyers who are willing and have the financial resources to ensure both stable or rising values and good physical condition. The most significant obstacle to assuring that cycle is the oversupply of lowerincome, sometimes dilapidated, multi-family properties, deteriorating aged retail strip centers, and the occasional incompatible use – most notably the industrial use along White Oak Bayou just south of West Little York. These elements in the Study Area landscape create uncertainty that may be sufficient to deter home buyers from making the needed investments in the single family neighborhoods. Though rapid gentrification and home value increases have occurred in parts of the nearby Oak Forest neighborhood, its location is not directly adjacent to the Study Area, and it is not anticipated that this market momentum will carry over to the Study Area in the short term. The nature of the retail and commercial properties in the Study Area is determined by the health of the surrounding residential neighborhoods – the income distribution of the population and the general sense of whether investment is occurring. It typically lags residential revitalization, often by a considerable period of time. Commercial revitalization rarely occurs in advance unless the structures are architecturally noteworthy or uniquely positioned adjacent to a destination amenity. Therefore, though Strategic Objective 2 focuses on the single family market, it is also the key to reviving retail and commercial activity over the longer term. Therefore, a continuation of the large-scale intervention by the City of Houston is necessary to ensure this near-term stability. In the process, the City and other entities can also create Livable Centers infrastructure that will add a new dimension of mobility and sustainability to the area. These actions can occur on an accelerated basis or a more moderate track; the time frame of stabilization and economic upswing will vary depending on which level of intervention is chosen. Although the City has taken heretofore unprecedented measures to demolish blighted multi-family structures in the De Soto / Hollyview area, it does not actually own those sites. Given the absentee ownership of many multifamily and commercial properties, plus the highly fractured and convoluted ownership structure of properties such as Candlelight Trails and Candlewood Glen, “arms-length” (willing, non-forced transaction) sale of the properties to the City would be unlikely in the near term. Therefore, a quicker turnaround could only be accomplished through condemnation by the City. Normally condemnation of private property must be undertaken for conversion of those properties into public uses only. The Texas Constitution and Local Government Code prevent acquisition of privately owned properties for conveyance to private developers. 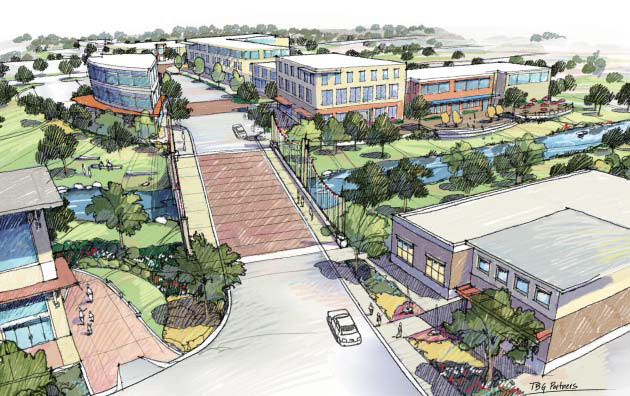 The redevelopment scenario envisioned in this study would convert many of the blighted multi-family and commercial uses in the Study Area to both public open space / recreation and private housing or mixed-use. State law provides for only one way to include private redevelopment on properties acquired through public condemnation: the Urban Renewal statute (Local Government Code Chapter 374). Public streets and properties such as De Soto Street, portions of Hollyview Street, and the Harris County Flood Control properties along White Oak Bayou and Vogel Creek could be included. The plan would exclude existing single family homes. Since this includes non-condominium properties, the plan would require a citywide vote. This level of intervention would reach far beyond actions the City has taken in the past, so a great deal of political groundwork would be required. The City could highlight other potentially similar blighted areas (Broadway, Fondren Southwest, Spring Branch, Sharpstown / Gulfton, etc.) and package together as a way of garnering widespread voter support. HUD funds (administered through the City of Houston Housing and Community Development Department) – as the area’s current demography has a large low-income component, the public improvements and amenities would be shown to benefit that population; property resales for housing development would need to have stipulations of affordability relative to area median income. It cannot be over-emphasized that an Urban Renewal approach, along with large up front redevelopment funding, is technically possible but represents an outsized political and fiscal commitment by the City. Normally the City would not be expected to pursue this route. Political support for elected officials and administrators will be needed from the community, and indeed citywide, for this strategy to be viable. Because the accelerated scenario just outlined may be difficult to bring about, it is useful to consider a more moderate level of intervention. The principal difference is that property acquisition by the City through the use of the Urban Renewal statute would not be pursued. The only acquisition would occur when funding partners such as the Houston Parks Board could bring additional resources to fund an "armslength," friendly transaction. Otherwise, the City would focus on the improvement of existing public properties and rights of way. 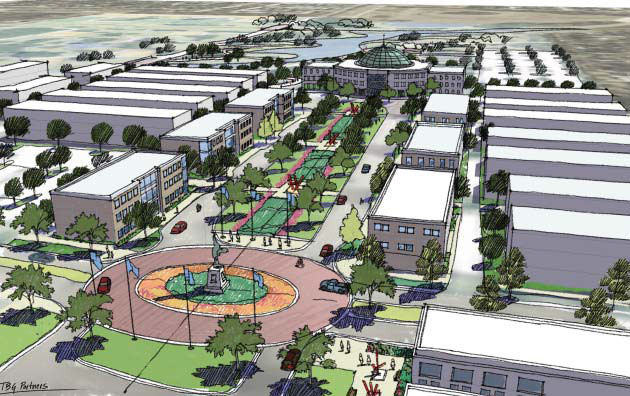 For example, instead of acquiring and redeveloping the properties on the south side of De Soto, the City would improve De Soto Street (such as adding sidewalks), and put incentive policies in place to encourage redevelopment. These incentives could be especially helpful in defraying the costs of property assembly for some sites that the private sector is unlikely to pursue in the near term, such as Candlelight Trails and Candlewood Glen, because the assembly costs would likely outweigh the potential returns from redevelopment. Chapter 380 agreements – Texas law allows the City a great deal of flexibility in assisting private development through offering grants, subsidies, loan guarantees, and other help. The City has recently enacted several Chapter 380 agreements for development projects, usually based on incremental tax revenue generation and the meeting of specific public policy objectives such as the developer’s provision of public infrastructure or desired types of employment. The City could offer Chapter 380 agreements to developers within the Study Area whose projects meet objectives supporting the Livable Centers plan and provide new, affordable for-sale housing. New Markets Tax Credits – The U.S. Department of the Treasury’s Community Development Investments Fund administers the New Markets Tax Credit program, which helps financial institutions make investments in ventures serving economically challenged populations that would not otherwise have fit within typical financing criteria. It appears that the Census tracts in the Study Area qualify as locations that meet the program’s eligibility criteria. The City of Houston may create an entity that can receive the tax credits which make these transactions possible; local private financing institutions can also receive them. The City could help coordinate applications for New Market Tax Credits that finance property redevelopment in the Study Area that provides affordable for-sale housing as envisioned in this plan. The program could also assist retail or other businesses in the Study Area that are expected to serve or employ low-income Study Area residents. The moderate intervention scenario assumes that the City continues with its multi-family rehabilitation and code compliance efforts (including additional demolitions as required) using HUD and other funding as available. The apartment complexes west of Antoine along Tidwell should be considered for inclusion in this effort. It should be noted that except for tax increment funding, the same funding partners as noted under the accelerated scenario could be approach to accomplish appropriate projects that advance the plan. The moderate intervention scenario, while accomplishing improvements that fit in with the Livable Centers plan, is highly unlikely in the near term to accomplish the significant redevelopment of private properties envisioned herein. Such redevelopment, and associated demographic change toward a more firmly middle-class profile, will take several years to get underway, with truly significant change possibly more than a decade in the future. Still, the continuation of the City’s current efforts plus the additional investments and incentives will help the Study Area turn an economic corner so that it is set on a market upswing, even if a slow one. In either the accelerated or the moderate intervention scenarios, the City of Houston will likely need to adjust regulations for private redevelopment so that pedestrianfriendly designs do not require variances. Creating a district that allows or encourages site and building design according to the standards provided in the Transit Corridor ordinance (primarily within Chapter 42 of City code) would be an appropriate approach to this issue. This will allow reduced setbacks along Antoine and other major thoroughfares and assure minimum clear sidewalk widths of 6 feet. Other modifications will be necessary to allow shorter block lengths and smaller lot sizes than currently allowed in the “suburban” area as designated by Chapter 42. This is particularly important due to barriers that restrict street connectivity. Strategic Objective 3: Elevate the Study Area’s regional market awareness through unique and functional open space investments that simultaneously build community. Action: Create activity and development node at Antoine / West Little York / Victory based on destination-quality open space, education, and recreation. A set of core recommendations in this study call for open space, community gardens, and the destination-quality White Oak Gardens in the area of the intersections of West Little York and Victory with Antoine. These elements, along with the Five Bridges enhancements in the same area, will elevate the Study Area to a level of positive regional prominence that has previously lacked. This market awareness should bring increased demand for the adjacent single family housing. The Harris County Flood Control District owns the stream channel along White Oak Bayou. This provides the starting point for these open space improvements. In addition, the flood buy-out area in the former Arbor Oaks subdivision east of Antoine provides ample land for multiple community garden initiatives. However, the White Oak Gardens and possibly some other open space elements will require acquisition of what is currently private property. This can occur via the accelerated or moderate scenarios outlined in Strategic Objective 2 above if some portion of the acquired properties are anticipated to be resold for private redevelopment. The City could use eminent domain for a property that is anticipated to be fully reused as publiclyowned open space, though this would constitute relatively aggressive action as well. More likely is a moderate intervention scenario with a friendly acquisition by either the City, private not-forprofit organizations, or educational institutions (Lone Star College). Several of such organizations were listed under Strategic Objective 2. Other organizations that could assist in bringing funding or other resources include various foundations; provision of public open space amenities and related educational activity has been a focus of assistance for some major foundations in Houston. Alternatively, the Near Northwest Management District or other community-based entity could spearhead the creation of a 501(c)(3) corporation to raise funds for site acquisition and improvements through tax-deductible contributions from individuals and businesses. There is precedent in Houston for this type of structure; both the Houston Downtown Management District and the Westchase District have affiliated 501(c)(3) entities. It should be noted that a 501(c)(3) organization, the Houston Botanic Garden, already exists to fund its namesake project on a not-yet-named site. Dialogue should occur to see if White Oak Gardens could meet some objectives of this organization and possibly receive resources or other assistance. If reactivated, Texas Parks and Wildlife grants (Urban Outdoor Recreation or Regional) might also be able to aid in funding portions of the destination open space that are to be owned and operated by the City of Houston or Harris County. The community gardens element is relatively inexpensive in terms of capital costs. However, since these are neighborhood-based, the expected resources would be coming from neighborhood groups that may have limited capacity, especially organizationally. Community gardening advocacy groups such as Urban Harvest can provide technical and organizational assistance to help neighborhoods cultivate new gardens. National organizations exist that provide small grants (often under $2,000) which are sufficient to construct starter gardens. The Near Northwest Management District can work with both civic clubs representing single family neighborhoods and apartment complex managers to educate them about the community gardening opportunity. In summary, the open space and related educational improvements are going to necessitate multiple partnerships with not-for-profit organizations and others. The Near Northwest Management District can spearhead the initiation of dialogue to work toward these partnerships. Strategic Objective 4: Capitalize economically on existing and potential transit services. Action: Create a transit-oriented vibrant place at Tidwell and Antoine. The streetscape and sidewalk improvements along Antoine will support and enhance the travel experience for users of existing transit service, particularly the route 85 bus line. However, the presence of a rail corridor where commuter or urban transit could be installed brings a potentially more powerful foundation for placemaking, reshaping mobility patterns, and economic development. Of course, the willingness and financial capacity of METRO to invest in the BNSF corridor is purely speculative at this point and is definitely a long term time frame scenario. However, the Near Northwest community should monitor METRO’s plans and prepare for transit-oriented development (TOD) possibilities at the Antoine / Tidwell intersection should rail transit plans begin to take shape that include a station there. If and when rail transit service becomes definite, to encourage TOD the City should apply the same tools as outlined under the moderate intervention scenario in Strategic Objective 2 – Chapter 380 and New Markets Tax Credits. To the extent that new multi-family properties are encouraged that provide housing to middle-income renters, the City and the District should highlight HUD’s Mortgage Insurance for Rental and Cooperative Housing under Section 221(d)(3) and 221(d) (4) which is available directly to developers. If METRO had to acquire land for the station (for example the triangle at Antoine and Tidwell), the agency may have excess property beyond that required to serve transit passengers. METRO could consider ground leasing this excess to developers and/or business operators to build facilities containing services, such as convenience retail and dining, that would be appropriate for serving transit patrons. One particular opportunity in the TOD area is Harris County’s property (excluding two front pad sites) at the northwest corner of Antoine and Tidwell. The county operates a social services center there, apparently repurposed from a former strip retail structure. It is likely that many customers and clients at this center arrive by transit. The City and District should work with Harris County to plan for redesign and/or redevelopment of that site to accommodate the same services while creating a more pedestrian- and transit-friendly environment. At the same time, the City and the District should also plan for pedestrian improvements around the potential station site. These improvements could be eligible for federal funding similar to that identified in Strategic Objective 1 (though program names and specifications may have changed by that time). The spread sheet (which can be downloaded here) illustrates the probable Public Improvements and Private expenditures that, as a whole, make up the physical components of “The Plan”. The chart groups specific activities into Strategic Objectives which relate generally to a time frame and a district within the overall Livable Center Study Area. Using “Strategic Objective 1” as an example, the suggested enhancements include improvements along Antoine which include streetscape improvements, transit enhancements and bridge branding. It is thought that these improvements could commence in the near term and be completed over the next 5-8 years. All of the activities in Strategic Objective 1 are Public Improvements and their costs are estimated by using known unit costs or through information provided by similar systems, such as the existing Metro “Quickline” service. Strategic Objective 1:Distinctive, memorable, multimodal environment for those traveling within or through the Study Area. Strategic Objective 2: Stabilize and fortify the single family residential market by reducing the supply of nearby deteriorated, blighted, and nuisance properties. As noted, Objective 1 is primarily a public effort whereas the following three are more dependent on private efforts and are fairly long term with anticipated activities occurring after 2020. In today’s dollars, it is estimated that a $57 million dollar public investment could assist at leveraging a $190 million dollar private investment and a rebirth in the Antoine corridor. This is just the beginning of a great future for the area. The redevelopment of Antoine as a mixed retail/residential area has long been a dream of many who still live, work and play in the area. We have a lot of work ahead of us but it is doable! Let us work together and get it done!